We had about half day left to explore Barcelona since our flight to London was not until 4.40 pm. We booked the flight via Easy Jet and it cost us €115 in total since we chose to have one 20 kg luggage allowance per person. After getting ready, we checked out from the hotel and had our luggage stored in the hotel storage. 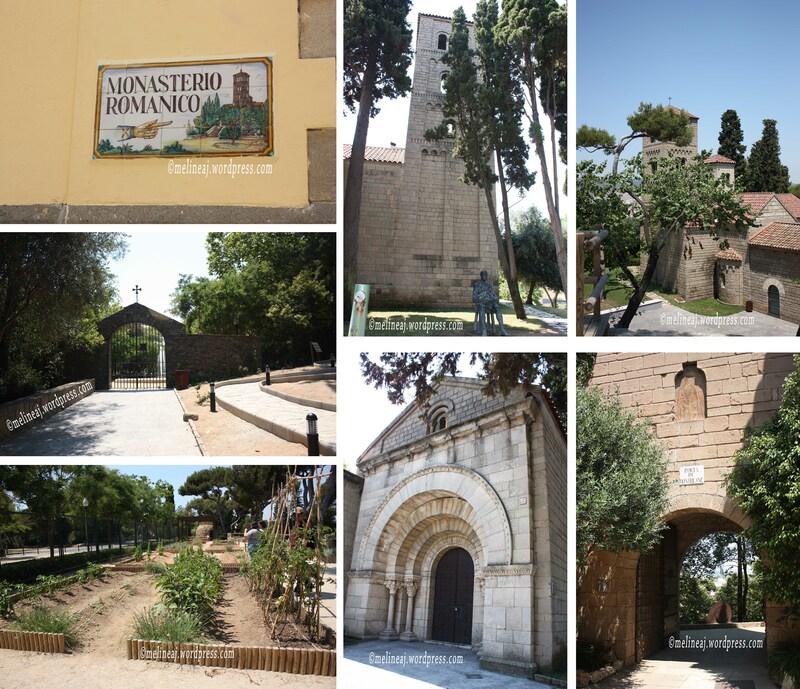 At 10 am, we headed to Castell de Montjuïc that was not too far from the hotel. But the problem was that the castle was at the top of a hill. We could take a 40-minutes walk there. Another way to get to the castle was riding a cable car. In order to get to the cable car station (Parc de Montjuïc Station), there are 2 alternatives: you have to go to Paral·lel metro station (L2 and L3) and then transfer to Montjuïc Funicular (the funicular fare is included in metro pass, so you don’t have to pay extra but the cable car is EXTRA, so you must purchase a separate ticket) OR by bus# 50 or 55 (ref). Since we were nowhere near Paral.lel station, we decided to take a bus# 150 from Av Ferrer i Guàrdia-Mèxic – between the Magic Fountain & Poble Espanyol. The bus ride was about 5-10 minutes along a zig-zag uphilll road. We got off at the very last stop that was right in front of the castle. 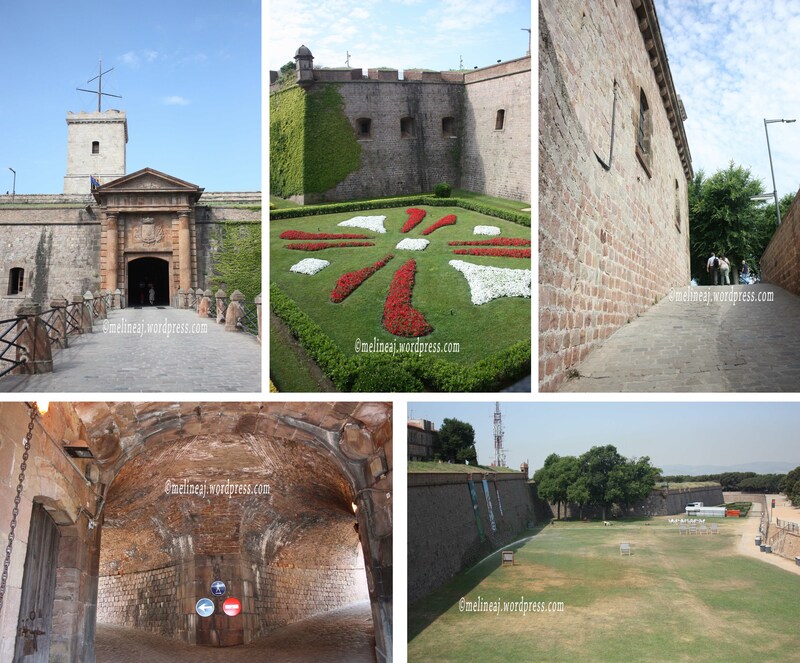 The entrance to Castell de Montjuïc is FREE! Sweet! From the front, this 17th century castle/fort didn’t look too appealing. The moat surrounded the castle is now a beautiful manicured lawn with an archery site nearby. There are some big cannons that were used in the battle scattered around the castle. Well… don’t judge the castle by its curb appeal! 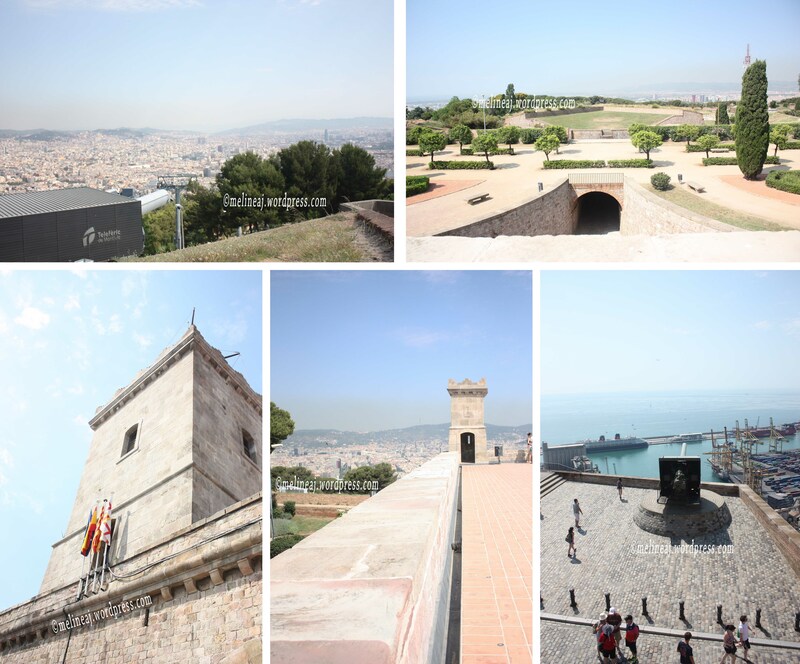 hahaha… Once we hiked up to the top of the fort, we saw a breathtaking 360° view of Barcelona! We saw the beautiful Balearic Sea with Port de Barcelona nearby. At the opposite side, we saw the small houses in Barcelona with the majestic Sagrada Familia standing among them. The security at the castle was pretty strict. A tourist climbed up to the fort wall to take a picture and the guard immediately came and forced them to go down. There wasn’t much too do here aside from enjoying the beautiful view of Barcelona. We spent a good hour to explore the castle and took bus# 150 again to go back. 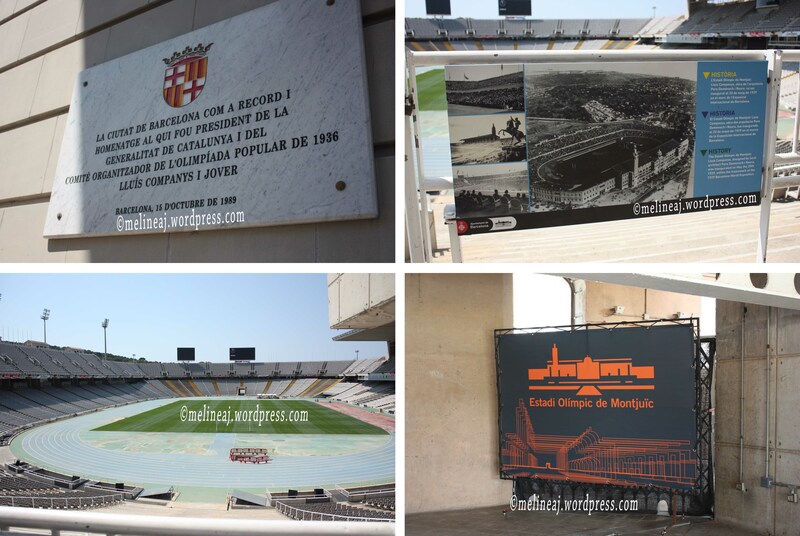 Along the way, we decided to stop at Barcelona Olympic Stadium (Estadi Olímpic Lluís Companys or formerly known as Estadi Olímpic de Montjuïc). This stadium was built for 1929 Expo and used during 1992 Summer Olympics. The entrance into the stadium is free. Here, I finally bought a book about Gaudi’s work since I was too hesitant to buy one when we visited Sagrada Familia the day before. In my defense, the book was expensive and my hubby convinced me that I would never read it 😛 Welll… in fact, I’m only half way reading that hahhaah. I was lucky that I bought the book there since I could find none at the airport later and apparently, it’s hard to find a book about Gaudi in North America!!! 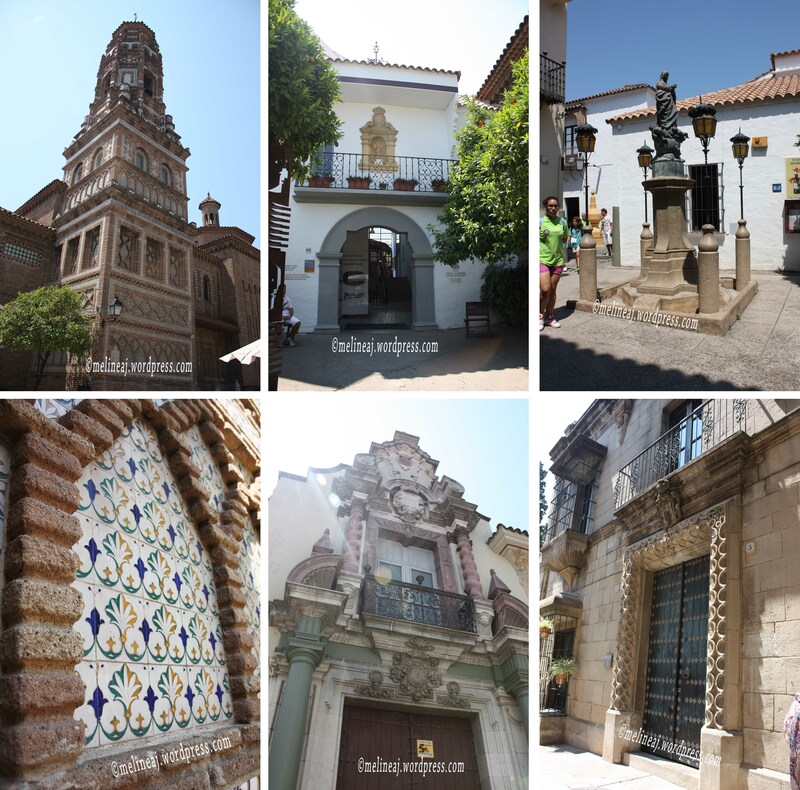 Since we still had couple hours to spare, we took bus# 150 to Poble Espanyol. 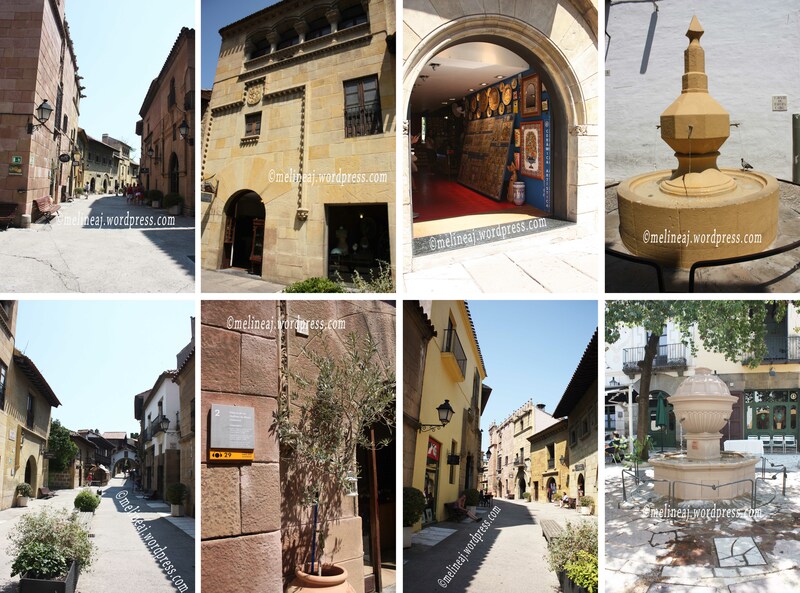 Poble Espanyol is an open air museum that was constructed to resemble traditional Spanish village (ref). The entrance fee is €11 – pretty expensive in my opinion. Why? Because I felt that it was just an outdoor mall inside a Spanish village. I was kinda scammed since it felt like I had to pay a fee to enter a mall! However, only few shops had cheaper souvenirs than those at more touristy areas. I wanted to buy a Spanish style house number – the ceramic one with ornamental border but it was gonna cost us around €50! Pretty hefty tag for a simple house number, so my hubby strongly opposed the idea! Anyway, we tried to max out our experience by taking lots of picture in front of the unique Spanish style houses. It has a monastery model at the very back of the museum with a model farm that was just charming. Inside one of the buildings, they have a glass blowing demonstration where people can observe how they make the beautiful decoration. Actually, twice every evening, they have flamenco show inside the museum and the ticket starts from €39 (ref). There are some restaurants around the courtyard in the museum. Some tourists gave good reviews for the restaurant, so it might worth a try. 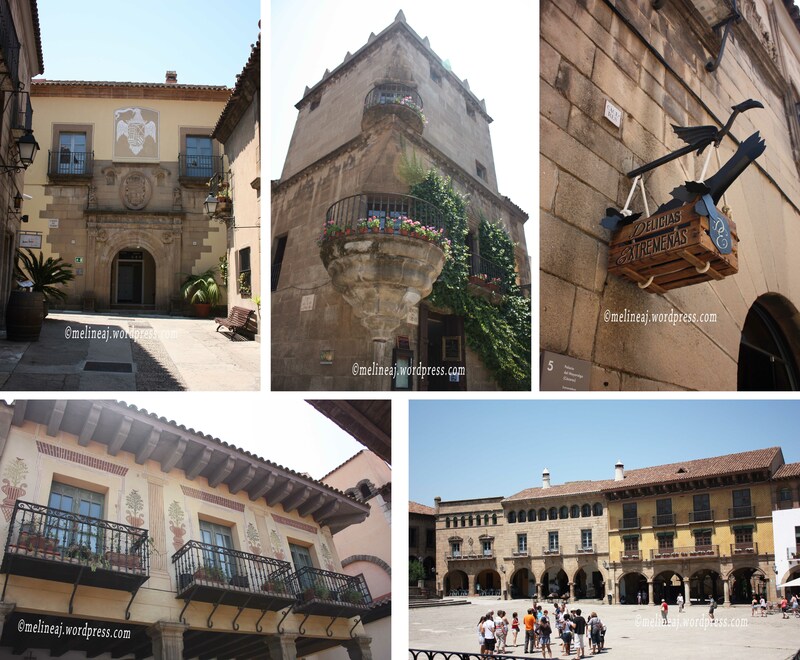 After about 2 hours at Poble Espanyol, we took bus# 23 to go back to Plaça d’Espanya. We got off at the roundabout and quickly went to Las Arenas shopping mall. Outside the entrance, there was a little elevator that goes up to the top roof where you can get 360° view of Barcelona. Since it costs €1 per person and we already saw the beautiful view of Barcelona from the top of Castell de Montjuïc, we passed this. If you don’t want to pay the elevator, you can access the top roof by the escalators inside the mall (it’s free!). There are lots of smaller shops inside the mall but we didn’t have chance to explore it all since it was almost time for us to go to the airport. 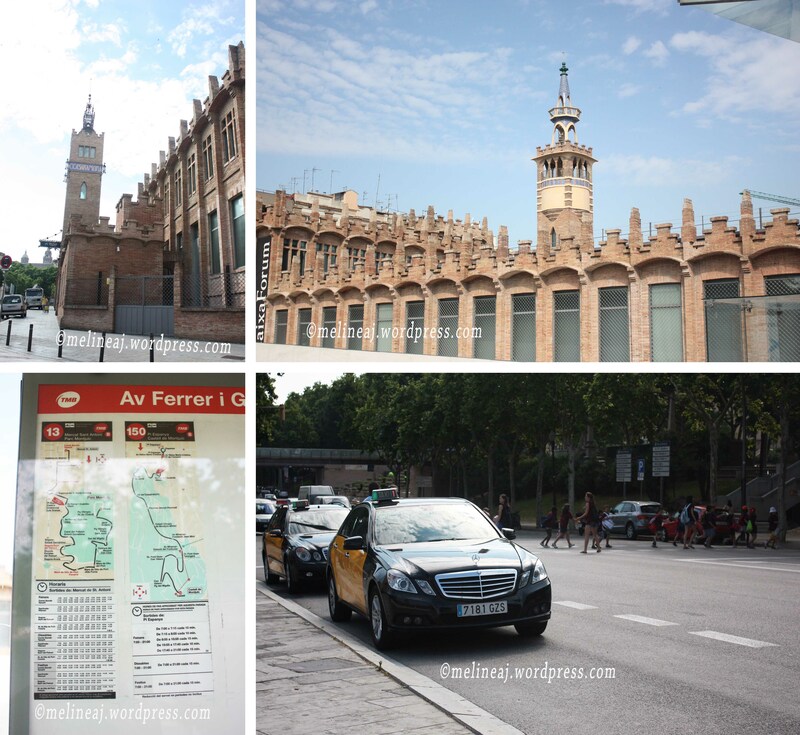 We went back to hotel to pick up our luggage and walked in front of Hotel Catalonia Plaza Barcelona to catch Aerobus A2 (terminal 2) to Barcelona–El Prat Airport. Thank God that the traffic was smooth and we got to the airport with plenty of time to spare. We followed other passengers that got off at the first stop / terminal B. Later, we realized that our flight departed from terminal C and we had to walk 5 minutes east from the terminal B! Once we got to terminal C, we saw that there was an Aerobus stop nearby… Ughhh… Terminal C is a smaller terminal where all Easy Jet gates are. We expected that we would spent our spare time to buy some souvenirs at the duty free shop inside the airport but the terminal only has small shops inside 😦 Also, the cashier there was annoying! I bought 2 chocolate bars and he gave me €10 worth coins as the change!!! Argggghhh…. Barcelona had been a fun city for us! I’m glad we chose Barcelona over Milan as our stop in Spain 🙂 This colorful city with unique modernism architecture has captured my heart. Some side notes about Barcelona: if you are at souvenir shops, don’t hesitant to bargain the price – especially the shops at La Rambla. My hubby wanted to buy a shirt and the shop keeper initially said the shirt was €30. My hubby then showed disinterest because of the price and the shop keeper immediately said that the price was negotiable. He finally bought the shirt for €17. The same happened to me when I bought an espresso cup with its saucer. The sticker price was €20 but then the shop keeper gave me ‘special’ discount for €10. So yeah… the sticker price wasn’t the real price and you MUST bargain to get a ‘fair’ price. Another thing confusing me was the metro pass. As I mentioned in my post Barcelona day 11, T-10 pass is valid for 1 hour and 15 minutes as long as you didn’t re-insert your pass within the time frame (which counts as 2 trips). We didn’t really comprehend the rules when we were there; hence, we were wondering why the machine deduced our pass when we took another metro while still in the time frame. Not that the metro was expensive or what, but if we planned our trip wisely, we might save some pennies. As in many touristy places, some restaurants at the main road along Port Vell are tourist traps. They charged for seating fee and high price on low quality food. This scares me especially when you want to eat seafood. It’s no fun when you get food poisoning on your trip! Do take advantage of online review from different sources, such as Tripadvisor, to find a reputable restaurant.